Basin Street Records’ Newest Artist!!! (New Orleans, November 19, 2008) Mark Samuels, president and founder of the award-winning New Orleans’ based record label, Basin Street Records, is pleased to announce the label has signed an exclusive recording agreement with trumpeter/vocalist/composer Jeremy Davenport. 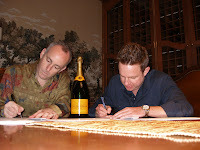 The first recording of this two record deal is scheduled to begin next month with a proposed spring 2009 release date. Jeremy Davenport specializes in a unique genre of jazz that captures the improvisational and spontaneous facets of this truly American art form. A devout fan of storytelling standards of past ages, he pushes the boundaries of modern jazz stereotypes while celebrating the song-and-dance element that inspires romantics worldwide. A merit scholar at the prestigious Manhattan School of music, Davenport began private study with Raymond Mase and Wynton Marsalis. He went on to study at the University of New Orleans with the patriarch of the Marsalis family, music educator and jazz pianist Ellis Marsalis. His talents flourished swiftly under such renowned tutelage. His craftsmanship and tireless work ethic became indisputable and he was honored to become the youngest performer on four world tours with Harry Connick Jr.`s Big Band. Currently he can be found performing multiple international Jazz festivals and special events with his own band and at New Orleans’ Ritz Carlton on Thursday, Friday and Saturday evenings. Mr. Davenport`s discography includes the self-titled Jeremy Davenport (Telarc) released in 1996, followed by his sophomore recording, Maybe In a Dream (Telarc) in 1998. He was also featured on the soundtrack to the Luke Perry film Life Breath, and on the RCA Victor compilation, The Only Jazz Album You`ll Ever Need. He is also featured in Harry Connick Jr`s recordings, Blue Light Red Light, When My Heart Finds Christmas, Star Turtle, and Come By Me. He has also been seen as a featured musical guest on Food Network`s Emeril Live. Mark Samuels formed Basin Street Records in 1997 with a focus on New Orleans based jazz, blues, funk, R&B and rock. Basin Street artists have been honored with Grammy nominations, Billboard Music Awards, Blues Awards, and have topped the charts on national jazz radio. The label released four highly critically acclaimed recordings in 2008 by artists Irvin Mayfield, Dr. Michael White, Henry Butler and Theresa Andersson. Additionally, the artist roster includes Kermit Ruffins, Jon Cleary, Jason Marsalis, Los Hombres Calientes, and the Headhunters. He has also been seen as a featured musical guest on Food Network`s Emeril Live.